The second version of a short film based on Stephen Crane’s second poem in his series “The Black Riders and Other Lines.” Directed by Tiffany Kim for the 2013 “Auteur 101” class in Film & Media Studies at Johns Hopkins Summer Programs. The second version of a short film based on the first poem in Stephen Crane’s series of poems “The Black Riders and Other Lines.” Directed by Tiffany Kim for the 2013 “Auteur 101” class in Film & Media Studies at Johns Hopkins Summer Programs. Stop motion is exciting, so I went into assignment #2 with gusto. The poem I chose, Stephen Crane’s second poem in his series of The Black Riders and Other Lines, is absurd. I really like the conflict between how ridiculous the birds are and how seriously they are treated. The poem’s rhetoric exaggerates the absurdity of the narrative. So I knew I wanted to make a weird, weird world for the short. The poem is also very eerie. To capture eeriness and absurdity, I wanted to create three creepy girls that attacked a normal man. I wasn’t sure exactly how, but I wanted the man in the poem to be horrified of the girls. I began with clay. I successfully made one horrifying girl who looked both alive and dead at the same time. I imagined her head would start spinning in the short and that she would eventually eat the man. But this never happened as no man was ever created. No other dolls were created out clay after I found it awful to have her move the way I wanted to as it was tedious work breaking anf fixing her limbs. And I couldn’t imagine doing it on four characters. So I said bye to the clay and struck pen to paper. I managed to make three rather creepy girls. I still wanted to make something horrifying. But as I started to set them up all in a row, I began to doubt my creepy intentions. I feared I was too attached to the idea of making something weird and scary and thought that prioritizing that idea compromised the overall short by making it feel artificial or insincere. So I went about my apartment and gathered some interesting looking things. I made different facial expressions for the girls and kind of let the assignment flow together. It was overall very fun to make. I am glad that in the workshop people wanted to see the creepy side of Crane’s poem being expressed in the video. I look forward to making something scary now that I’m less scared of coming off as formulaic or gimmicky. First version of short film based on the poem “The Black Riders and Other Lines (II)” by Stephen Crane, for a stop motion assignment. Directed by Tiffany Kim for the 2013 “Auteur 101” class in Film & Media Studies at Johns Hopkins Summer Programs. I started my first short with the idea of rebellion. That was the mood I got from the track I was provided by the wonderful Parallel Octave. 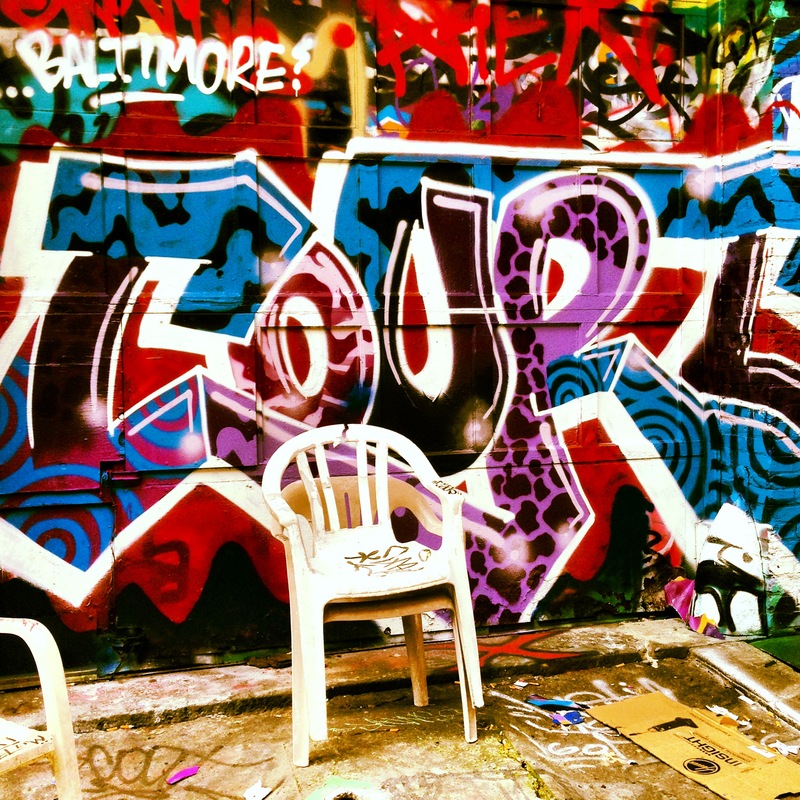 Thinking about the many treasures of Baltimore, I decided I was going to shoot clips of graffiti. After a weekend in DC, I woke up early on Monday, hopped on a JHMI shuttle to Penn Station, and started exploring the area. It was glorious. I immediately came upon large murals and worked my way into hidden alleys and backstreets. Along the way I shot clips of interesting vandalism like on mailboxes and doors and cars. I fell in love with these people who tagged up this city. Even without seeing their faces, I felt like I knew them. I was working my way onto the stoop of an abandoned house when a man sweeping leaves on the sidewalk noticed me flirting with the painted characters on the boarded up windows. He asked me if I’d been to Lanville, his speech whistling through missing teeth. I said I hadn’t and eagerly took his directions to find a quiet street covered in street art. It was amazing how exposed and free the graffiti looked. It was rightfully shameless. Before I headed back to campus. I took a walk to a spot I had read about online at http://hiddenbaltimore.wordpress.com/2012/11/13/baltimores-graffiti-alley/. It was a great way to end shooting. The blog post describes the hidden paradise very well, so I will just share a photo I snagged on my phone. The shooting experience was phenomenal. So I expected the editing process to fall a little short. I really enjoyed working on cutting my clips and arranging them. Which made losing my work very disappointing. I had to restart on Tuesday after incorrectly saving my clips. Then on Wednesday, half of my clips disappeared. Luckily, the original clips hadn’t been removed from the camera. There was a point where I was very frustrated and wasn’t sure if I liked what I was doing. But I comforted myself with the fact that this was only the first version. My peers provided extremely helpful insight, so I look forward to going back to editing! Overall, it was a great first experience.